While visiting Seattle, my cousin suggested that perhaps I would like to cook dinner for the family at her new house. Of cousre, who am I to pass up an opportunity to cook in someone else’s kitchen? The spread – couldn’t get everyone at the table at the same time since my cousin’s three-week old daughter was demanding personal attention the entire time. 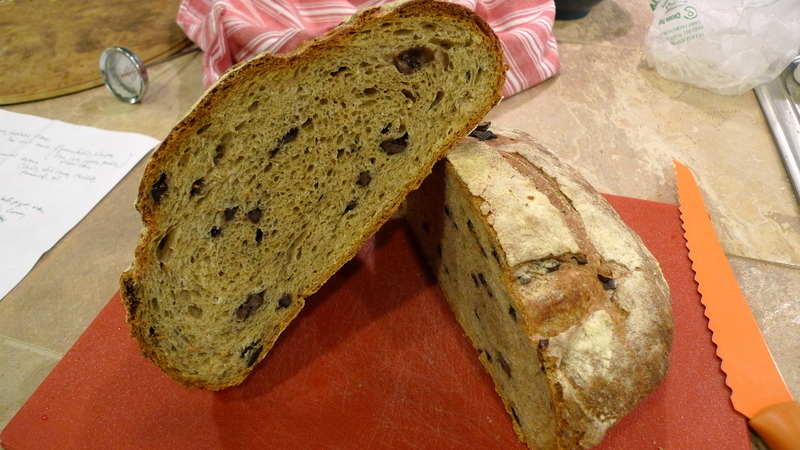 Homemade kalmatta olive and rosemary bread. 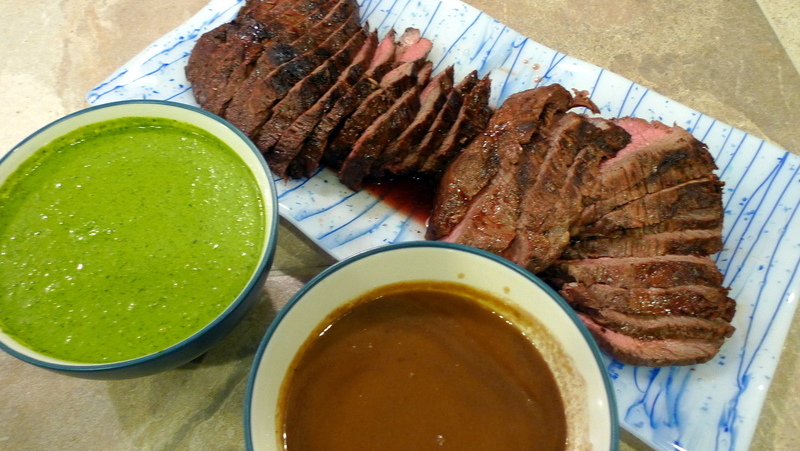 Grilled tri-tip of beef, marinated with soy sauce and ginger and served with two sauces, a Thai style green chili sauce and a tamarind sweet and sour sauce. 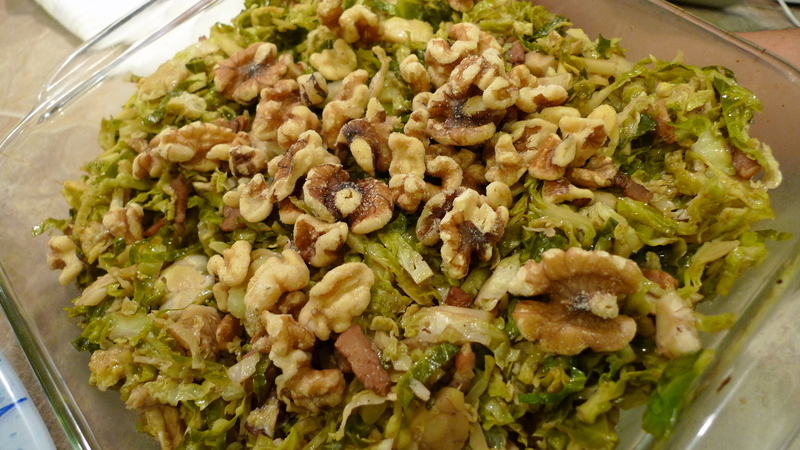 Shredded Brussels sprouts with bacon and walnuts. 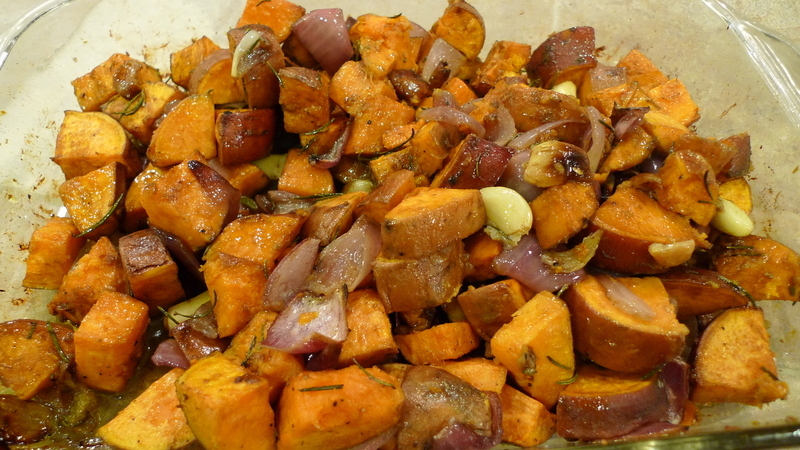 Roasted yams with red onions, garlic, and rosemary. 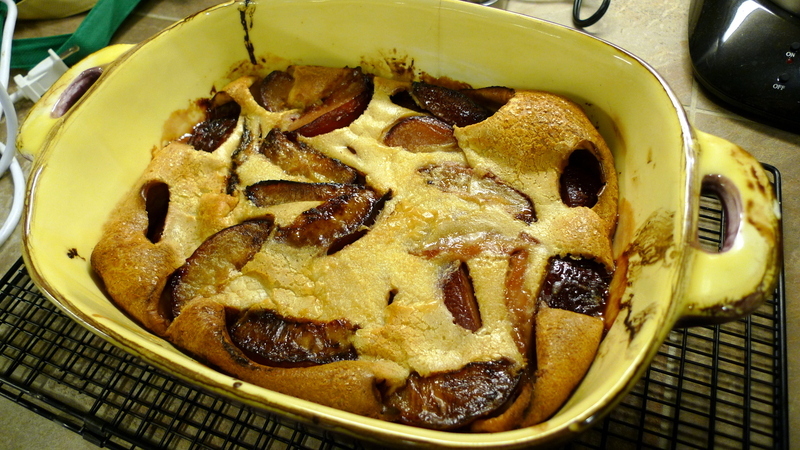 For dessert, a plum claufoutis, a French style baked fruit pancake. 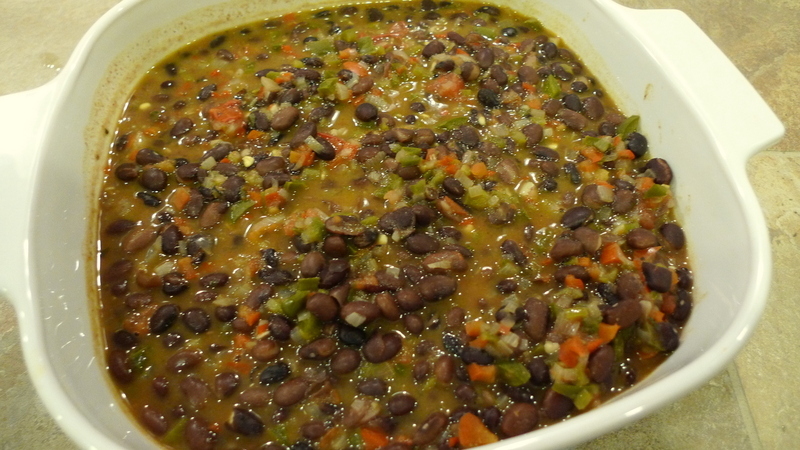 This entry was posted in Uncategorized and tagged cooking, Dinner, food by christao408. Bookmark the permalink. Mmm! I can imagine the wonderful smells! looks great! you’re welcome to come visit and cook for me anytime! i still haven’t quite worked out that bread recipe… i need to try it again sometime. i’m pretty certain the problem is that i always try to bake bread in the winter when my kitchen is too cold.how did you make the brussel sprouts? Wow…Chris! You are truly the male Martha Stewart counterpart…and much more (adding in tour guide, etc.)! Brussels sprouts! Yams!! I want to eat at your table!!! The bread looks very good. A loaf like that would sell for around $7 at the local farmer’s market in my neighborhood. It must be a bit awkward cooking in a different kitchen. But it looks like you were able to adapt very well. The roast beef looks SO good. I love RBeef when it’s REALLY really pink/red, it has SO much more blood so it has more flavor yum yum ! Chris, the meal was awesome – so delicious! Thanks for sharing your time with us and for taking the time to fix us an unforgetable meal. I would like to try the plum clafoutis as I’ve never had that dessert before. I am sure your cousin and her family were ecstatic at the meal you made. Listen, you can take over my kitchen any time and let me learn from you. Wow, what an incredible meal that had to be. This looks like such an amazing home-cooked meal! Eating at home is the best :). Oh my I need a bib because I am drooling and I bet it tasted as good as it looks. Oh my word, the food looks fantastic! Care to come to house to cook? my friends would love you! @rudyhou – Next time you visit, Rudy, I’ll cook for you. @ShadesOfAnnie – @ZSA_MD – @bengozen – @kunhuo42 – @Fatcat723 – Okay, good to know I have plenty of kitchens to visit in the US! LOL@kunhuo42 – Aaron, I sliced them thinly (or grate on a box cutter, mandoline, etc.) and sauteed with some bacon and finish with balsamic. Very simple but tasty. Good way to prepare them for folks who normally don’t care for Brussels sprouts. @secade – Glad you liked. Roast root veggies are easy to prepare, healthy, and tasty, too! @CurryPuffy – You are too kind Gary. Good seeing you. @brooklyn2028 – The claufoutis is such an easy dessert, Sheldon, but one that really impresses. Try it and let me know how it turns out. @mizz_chan – We agree: home cooked meals are fantastic and you are so much less rushed than in a restaurant. @pstoll5 – Glad you enjoyed the meal. Thanks to you and Uncle Carl for hosting me. I miss our morning walks. @murisopsis – All you need is a ticket to Bangkok! =D@Want2FitIn2Fat2Fit – I agree, most cuts of beef are at their best when there is still some pink. But different folks like different things… or so I’ve heard! 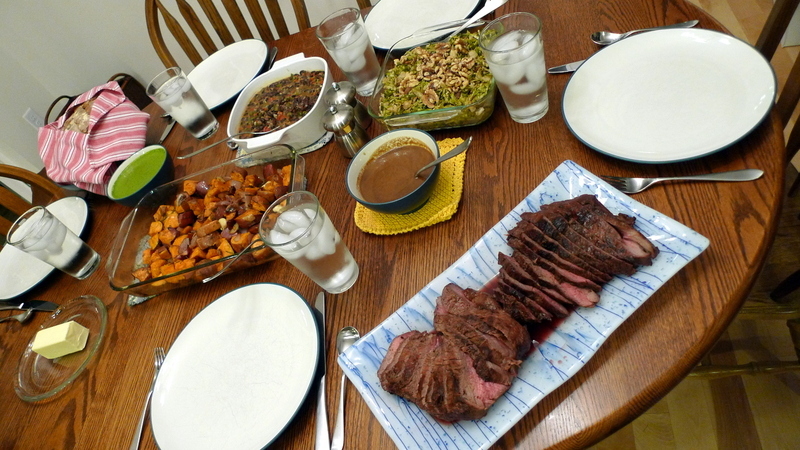 @whyzat – Especially from the roast yams, which with the garlic and rosemary really do perfume the house. @Grannys_Place – Given the vaguely blue-ish cast to the light, I hope it tasted better than it looks! Ha ha! @sarahflorida1085 – @Inciteful – Thanks, glad you enjoyed. @ElusiveWords – Thanks, Matt. That bread recipe has worked well for me every time and produces a very beautiful loaf. As for the cooking in a new kitchen, I must have opened and reopened each drawer a dozen times! this is amazing! i hope one day i get to eat something u make! did you cook through julia child’s mastering the art?? Beautiful Home Cooking as usual……..mouth watering….. Your food always look so mouth-wateringly good. @iskrak – I’ve only poked about that classic cookbook and haven’t delved that deeply into it. More than anything, I use it as a reference when making a specific dish or before using a specific technique. @agmhkg – @icepearlz – You are both too nice with your words.